The idea of making a soufflé often strikes panic in kitchenphobes, but it’s little more than scrambled eggs, and as a party piece, it rules. With just a few staple ingredients, you feed four and make magic, too. And once you have the technique down, you can add all kinds of extras, like chopped vegetables, nuts, and herbs. Two tricks: The egg whites and yolks must be well and truly separated. Should a speck of yolk infiltrate the egg whites, the egg whites won’t whip and expand. Also, soufflés need a calm environment to rise. Don’t blast your stereo or skip rope in front of your oven, and you’ll be fine. Separate the eggs, putting the whites in one large bowl (copper, if you’ve got it) and the yolks in a small one. Pour in the milk and stir gently for 3 to 5 minutes, until the sauce thickens and turns silky. Reduce the heat to medium. Stir in the egg yolks, grated cheese, mustard, cayenne, optional nutmeg, salt, and pepper, and stir until the mixture forms a golden, creamy, smooth sauce. Turn off the heat, remove the pot from the burner, and set it aside. Gently fold the cheese-sauce mixture into the beaten egg whites until the two combine but are still light and fluffy. Pour the mixture into the prepared soufflé dish or baking dish. 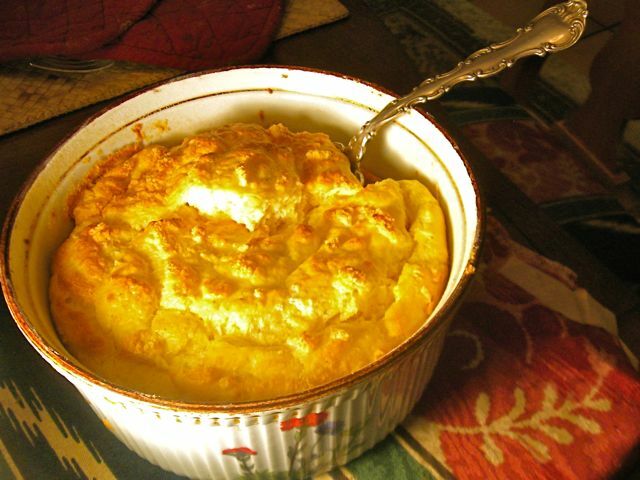 Place in the oven and bake for 30 minutes or until the soufflé has risen to an impressive golden-brown puff. Enjoy at once.